It has been an action-packed start to the year for the students and the Learning team. On Monday evening we welcomed Year 12 parents and students to our Information Evening: Surviving the Final Months of the HSC – a Family Guide. This event provided parents and students with practical strategies for navigating the final days before the Trial Examinations and the final weeks in the lead-up to the HSC examinations in Term 4. We wish Year 12 well as they move towards these events and urge them to now take the reins and drive their study and preparation process, seeking feedback and collaborating with their peers. 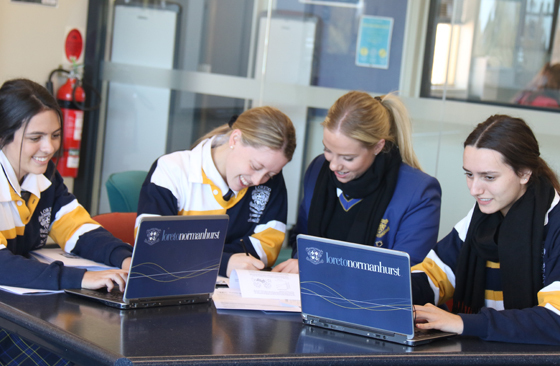 Year 10 students are currently experiencing a period of discernment as they make their way through the Subject Selection process for their senior studies. Parents have had the opportunity to meet with teaching staff to discuss their daughter’s options and students will have the opportunity to submit their subject selections on Monday 24 July. We wish Year 10 well throughout this decision-making process. In addition to this, Year 8 students are also selecting their Electives for their Year 9 studies – which is an exciting prospect as they begin to explore and specialise in the areas of learning that most appeal to them. These selections are due next Wednesday 26 July. As Year 8 and Year 10 students finalise their choices it is timely to remind both students and parents that the factor that most informs success in a subject is interest and passion for the area. If we enjoy what we are doing each day, we are more likely to succeed. The inaugural HSC Showcase 2017 is on Friday 25 August. This event will be a combined celebration of HSC projects across all subjects with practical components. The students are looking forward to showcasing their talents and efforts in these subjects with the school community. We look forward to more exciting Learning opportunities throughout Term 3 and wish Year 12 well this term. The Year 12 Trial examinations will take place from Thursday 27 July to Monday 14 August inclusive. During this time, students in Year 12 will not be required to attend regular classes. They are to arrive 15 minutes before each examination is due to begin. The starting times are indicated on the timetable. No allowance will be made for students who have misread the timetable. Students should also notify the school when they are returning to school so that make up examinations can be arranged. Make up examinations generally take place on the first day that the student returns to school unless other arrangements have been made with the Learning Office. Best of luck to all Year 12 students.